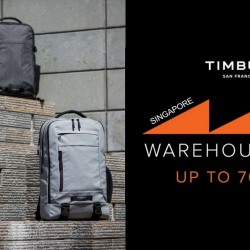 31 Oct - 4 Nov 2017 Timbuk2: Pre-Holiday Sale with Up to 70% OFF Backpacks, Messenger Bags, Totes & More! If you are looking for durable bags, Timbuk2 is the brand to look out for! The VERY FIRST TIMBUK2 PRE-HOLIDAY SALE! Get ready for Christmas and shop Up to 70% off on backpacks, messenger bags, bike accessories, totes, duffel bags and more!